As promised, part two of the guide on Memoriser is here. While part one is about practising with Memoriser, part two is about customising your Memoriser. 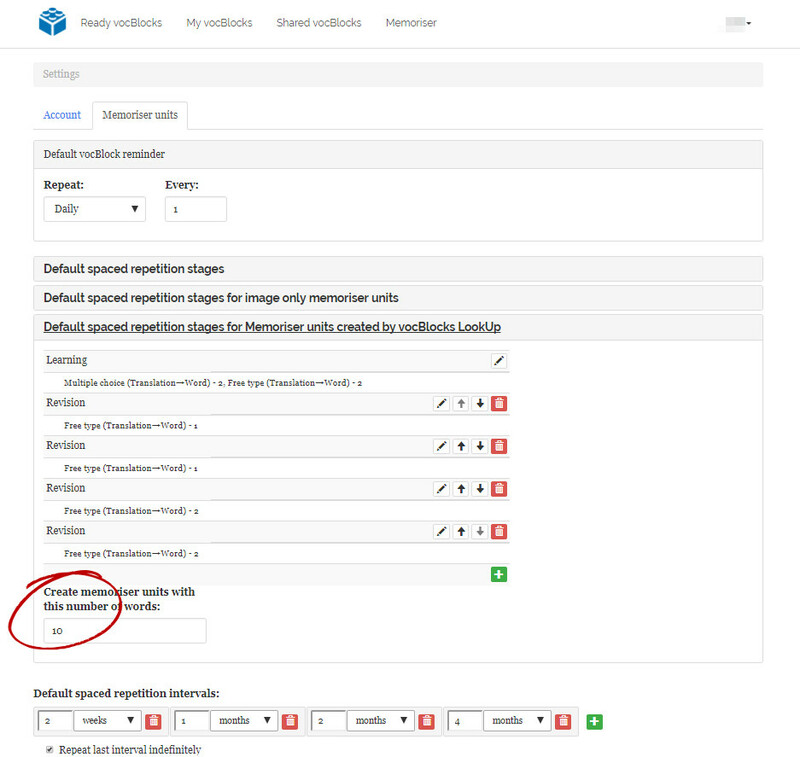 Changes to your Memoriser settings can be done in two ways: either in the Memoriser section by editing separate Memoriser units or in your profile settings by editing the parameters of Memoriser, so that these changes affect all future Memoriser units that you will be creating. Let me go into a bit more detail on each of these ways. 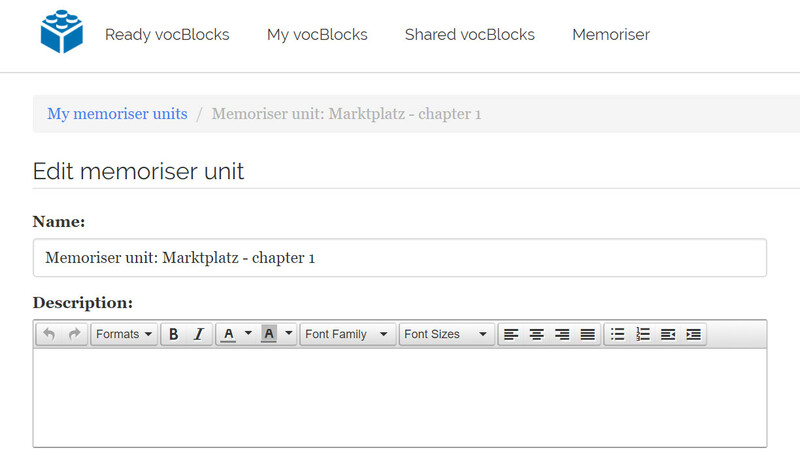 When you click the ‘Learn’ button, a Memoriser unit for this vocBlock with the name ‘Memoriser unit: [vocBlock’s name]’ is created and placed in your Memoriser section. If you go to the Memoriser section, you will see a list of all Memoriser units that you have. In order to make changes to a separate Memoriser unit, you need to press the ‘Edit’ button for this unit. You will then be taken to the Edit page where you can make changes to several Memoriser parameters. Let me go into a bit more detail on each of them. Name. All Memoriser units are named ‘Memoriser unit: [vocBlock’s name]’ automatically but if you feel that you would like to have a different name for a particular unit, you can change it here. Description. 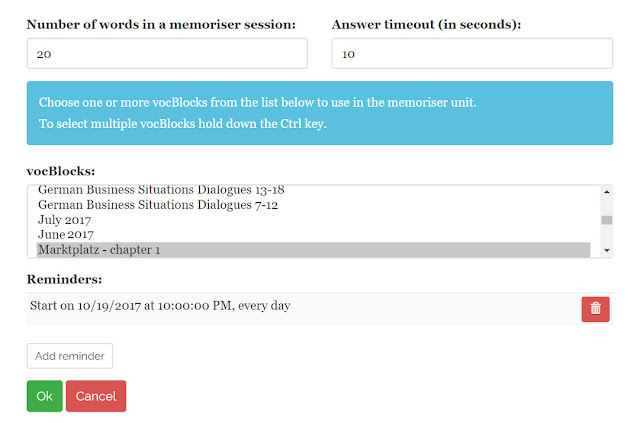 There is no description for any of the Memoriser units by default, however, you can add your own if you need to record some additional information, for example, a date you started with the exercises. Spaced repetition stages. 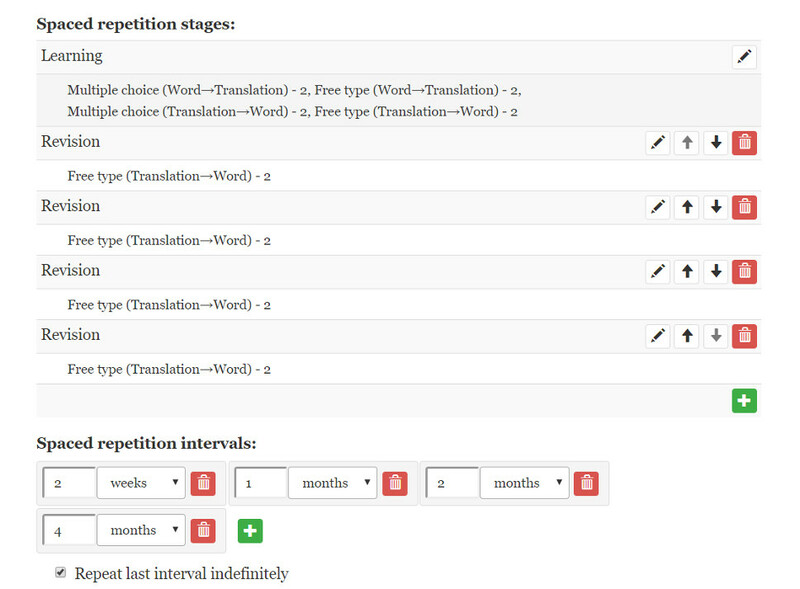 There are five spaced repetition stages by default. The first is learning stage while the rest are revision stages. The learning stage is the longest and contains multiple choice and free type exercises in both directions: Word-Translation and Translation-Word. (Please note that image only vocBlocks have multiple choice and free type exercises with just one direction Image-Word as the words and phrases included into these vocBlocks are illustrated by pictures, so normally do not need any additional explanation either in the form of translation or definition). For each type of exercises you will need to give two correct answers before moving on to the next type of exercises or to the revision stage. Revision stages contain only more difficult free type exercises with one Translation-Word direction and again you need to give two correct answers for a word to have it marked as learnt. However, you can change these exercises to suit the needs you might have at a particular time or to suit a particular vocBlock you have created. Each stage has the ‘Edit’ button on the right. For learning stage, you can change the type of exercises, the direction and the number of required correct answers. With revision stages, in addition to these, you can also delete and add revision stages as well as change their order. Spaced repetition intervals are set to two weeks, one, two and four months by default. It means that after the learning stage is over, you will be receiving reminders for revision of this Memoriser unit after two weeks, then one month, then two and then four months. 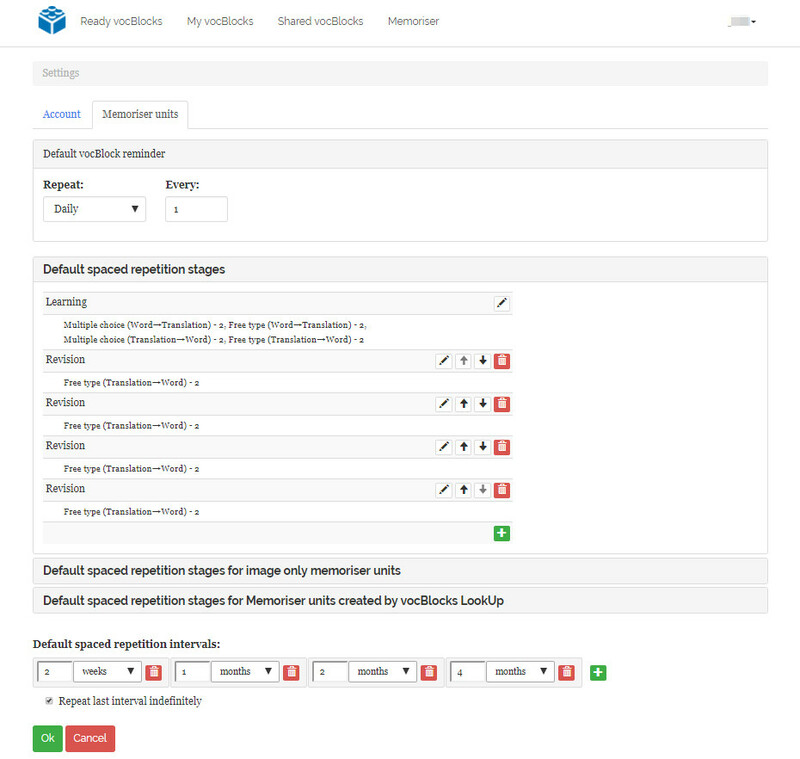 In this post, you can get more details on spaced repetition theory if you would like to understand the reasons behind the default settings. However, you can make changes here as well, i.e. increase or decrease the amount of time between revision stages and also delete and add them. The box ‘Repeat last interval indefinitely’ is ticked by default to ensure you don’t forget the vocabulary included into your vocBlocks. If you feel that you don’t need to continuously revise vocabulary for a particular vocBlock, you can untick this box here. Number of words in a memoriser session is set to 20 by default. In this case, you have short two to three minutes practice which you can fit in any time slot you have available during your busy day. However, if a particular vocBlock you would like to practise contains more than 50 words, you might want to increase the number of words included into one session in order to speed up the learning or revision process. 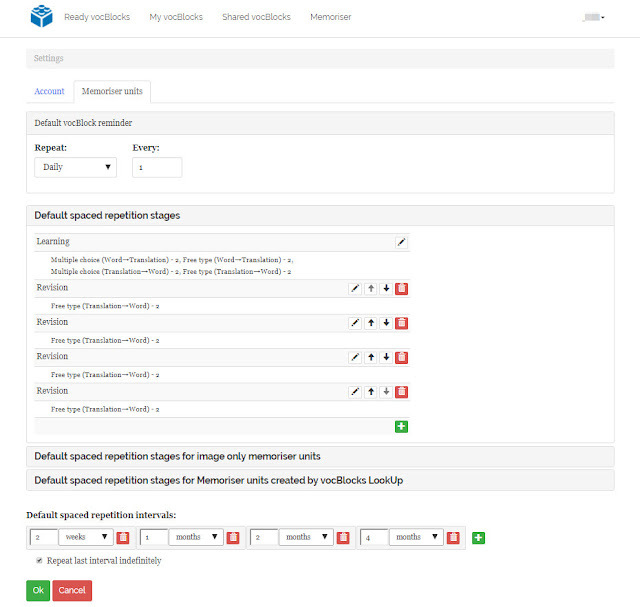 Answer timeout (in seconds) is set to 10 seconds by default. It means that you have 10 seconds to answer each question before the answer is displayed. If you feel that you need more time for trying to recall words or phrases in a particular vocBlock, you can increase answer timeout here. Also, if your vocBlock contains additional notes, longer explanations etc. which you would like to review before giving your answer, you will need to increase answer timeout as well. Please note, however, that if these notes include context where this word or phrase is used, it’s better to read it after you have given your answer to avoid the prompt. Increasing answer timeout will affect the duration of your sessions, so you need to take it into account when making these changes. Please also note, that timer set to shorter time than what is comfortable for you, helps you stay alert and pushes you to give answers quicker to ensure you know the vocabulary better. vocBlocks. Here you can see which vocBlocks are included into this Memoriser unit. Only one vocBlock is included into each Memoriser unit by default - in this list you will see this vocBlock selected. However, you can add more vocBlocks from the list (this list includes all vocBlocks you have in ‘My vocBlocks’). For example, you created a series of vocBlocks: one vocBlock for each episode of ‘Two and a Half Men’ TV series. Say, you have decided that each of them is too small to be practised on its own and at this point you have already created a Memoriser unit for just one of them. Here you can choose the rest of the vocBlocks of this series, so that all of them are included in one Memoriser unit. Reminders. 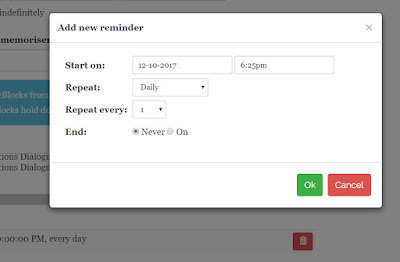 Once a Memoriser unit is created, a reminder is added to it automatically, so that you don’t need to do it yourself and so that you don’t miss a session. The reminders will be sent to the email address you used while creating your account on our website. If you logged in via a social network, an email address recorded in your social network will be used. The first reminder is sent on the following day after the Memoriser unit is created. The default time for the reminders to land in your inbox is the same time as when you created this Memoriser unit. For example, if you created your Memoriser unit at 10 pm, the reminders for this unit will be set to 10 pm as well. However, we do recommend that you amend it to the time just before your daily vocabulary learning/revision by replacing it with a new reminder with the time you need. Learning a foreign language as an adult requires building an iron-strong habit to ensure your busy life doesn’t take over and squeeze your language practice out of your day. You can always throw in more vocabulary practice when you have unexpected time slots like waiting in a queue or waiting for your date to show up, but it’s important to have some definite time slot in your day dedicated to vocabulary practice and the reminder settings are here to assist you with it. The default frequency of reminders is ‘every day’ to assist you with building and maintaining this regular habit of bite-sized vocabulary practice. However, if you decide that you want to work on some particular Memoriser unit, say, every other day, you can amend the frequency to 'repeat every 2' (days) by replacing the existing reminder with a new one with the appropriate settings. You can also choose some particular dates for the reminders to start and finish hitting your inbox. So, reminder settings help you get organised with your vocabulary practice and be the boss of your language learning as we believe that active learning is the only effective learning. The other way to customise your Memoriser, this time with the aim of customising it for all Memoriser units not just for separate ones, is editing the Memoriser parameters in your profile settings. Your profile ‘Settings’ can be found in the drop-down which appears when you click on your username in the upper right-hand corner (on any page of the website). 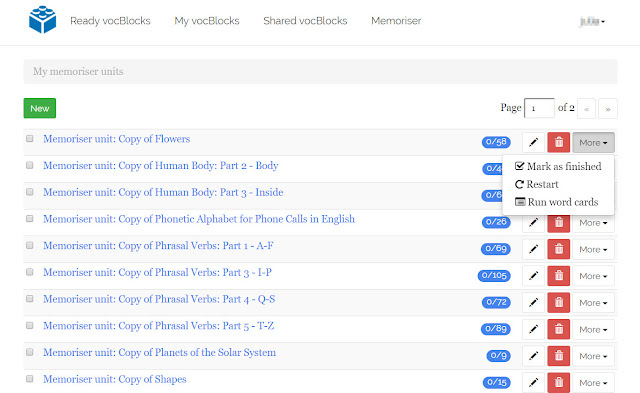 Spaced repetition stages can be set differently depending on the type of your Memoriser units: Memoriser units for regular vocBlocks, Memoriser units for image only vocBlocks and Memoriser units created by vocBlocks LookUp. Please note that for the latter the default number of words that the vocBlocks LookUp dictionary extension packages in a vocBlock is 10. 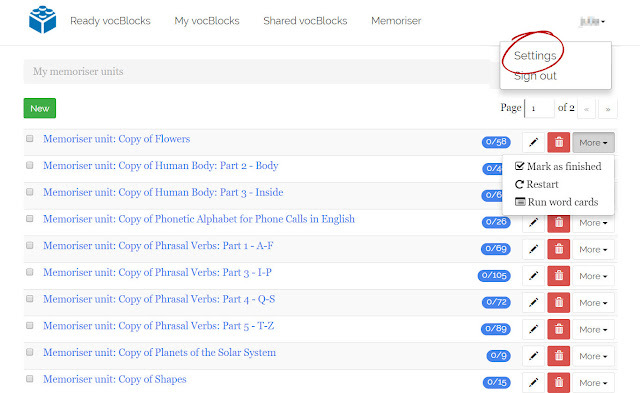 It means that once you have looked up 10 words using vocBlocks LookUp, they will be recorded into a vocBlock which will be sent automatically to Memoriser for you to learn. Here you can amend the number of words to whatever seems most suitable for you. Please note that the more words are included in a Memoriser unit, the longer it will take to learn and revise it. We hope that you find this short guide on how to customise your Memoriser useful. But if we have missed anything or you have a question please do not hesitate to drop us a line.